Cut slits in the top of the roast and place garlic cloves down in the slits. 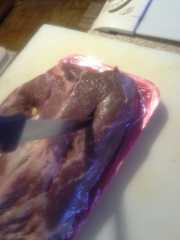 Then coat the outsides of the roast with garlic, powder, salt, and pepper. 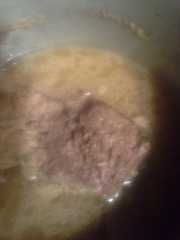 Place in frying pan on medium heat, brown on both sides then place in the pressure cooker. Cook for 45 minutes. Let go down on its own accord. Reserve two cups of broth. Place potatoes, carrots, and onion in the broth cook until soft. Use reserved broth and make a slurry with flour and water and make a gravy. Serve over roast, with Potatoes, carrots, and onion sides.